Bill Goldston, from Universal Limited Art Editions on Long Island, has been Jasper Johns’ master printmaker for over 30 years. Goldston produced the series of 16 prints that will be included in the exhibition. Tickets start at $5. Premier seating tickets available for $20. Join the Halsey Institute staff and fellow members for a fun and exclusive evening tour. Director and senior curator Mark Sloan will lead Halsey Institute members on a guided tour of the exhibition. Explore the exhibition and get insider knowledge about the curatorial process! This tour is for Halsey Institute Members only. 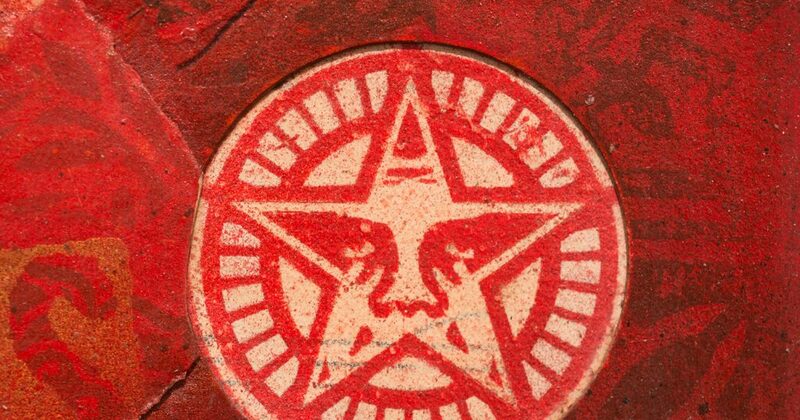 Born in 1970 in Charleston, SC this will be Shepard Fairey’s first major exhibition in his hometown. Beginning in the 1980s with an obsession with skateboard culture and a sticker campaign that went viral, Shepard Fairey has become one of the most visible street artists in the world. His seemingly ubiquitous Obama HOPE poster helped bolster his career (and, arguably, President Obama’s), and the National Portrait Gallery in Washington, DC acquired it for their permanent collection. Straddling the realms of fine, commercial, and street art, Fairey’s work resists easy classification. The artist exploits the gaps between these genres to produce works that frequently take on social and political issues. Fairey has become an articulate advocate for free speech and progressive ideas. His work is included in the collections of the Smithsonian, the Los Angeles County Museum of Art, the Museum of Modern Art in New York, the Museum of Contemporary Art San Diego, the National Portrait Gallery in Washington, D.C., and the Victoria and Albert Museum in London.